On Thursday, Sen. Cory Booker (D-N.J.) posted on Facebook a photo of Angela Davis and a quote: "I am no longer accepting the things I cannot change, I'm changing the things I cannot accept." The morning after the astounding election defeat for Democrats, Booker wrote, "This is not a time to curl up, give up or shut up. It is time to get up; to stand up, to speak words that heal, help, and recommit to the cause of our country … the searing heat of defeat reveals what we are made of." That time is coming in less than two months. If confirmed as U.S. attorney general, Republican Sen. Jeff Sessions of Alabama is all but certain to dismantle two agendas: civil rights and immigration reform. I've talked a lot with Sessions over the years on justice reform. He is one of the most talkative U.S. senators and has no problem relaying his views in a direct and unflinching fashion. Figuring him out is easy. He just tells you. What isn't as clear are the plans of his opposition. The question is, who will stand up to block the Sessions nomination before confirmation? Already, incoming Senate Democratic leader Chuck Schumer (D-N.Y.), who represents more African Americans than any other Democrat in the Senate, has signaled that he can work with President-elect Donald Trump on some issues. Does that include confirming his Cabinet? The two African-American Democrats who will serve in the Senate next year represent over 3.5 million African Americans and over 16 million Hispanics. Booker and Sen.-elect Kamala Harris (D-Calif.) will likely have to use the Senate rules to lead a charge of delay on several policy issues, but it won't be easy on Cabinet nominees. 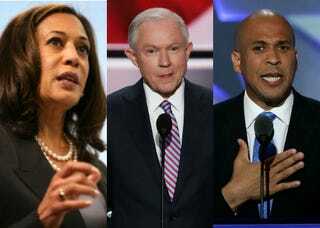 Will they be satisfied to quietly position themselves for a presidential run in 2020 or lead a public charge against a nominee in the early months of Trump's presidency? Sessions will need a simple majority (51) to become attorney general, assuming that he is voted favorably out of the Senate committee. It is absolutely no surprise that Trump has selected Sessions, who once declared the NAACP "un-American" and "Communist inspired," as the top law-enforcement official in America. Trump's nominee for attorney general was viewed by the Senate in 1986 as too racist to sit on the U.S. District Court in Alabama. Just think—this was at a time when segregationist Sens. Strom Thurmond and John Stennis served in the Senate. Sessions was only the second person in 50 years to be voted down by the Senate for a district judgeship. During the same 1986 confirmation, a U.S. attorney named Thomas Figures testified that he was repeatedly called "boy" by Sessions and was instructed by the Alabama senator to "be careful what you say to white folks” after Figures spoke assertively to a co-worker. Even the other senator from Alabama, Howell Heflin, ended up voting against Sessions' nomination. During those same hearings, Sessions had to deny he'd referred to a black elected official with the n-word. These are the career highlights of Trump's nominee for attorney general. But Sessions did serve as U.S. attorney for the Southern District of Alabama from 1981 to 1985. During that service, Sessions prosecuted three black activists for voter fraud, including a former aide to Martin Luther King Jr., Albert Turner. Turner had led marchers across the Edmund Pettus Bridge during the famous “Bloody Sunday" march in Selma, Ala., on March 7, 1965. What did Sessions prosecute Turner for two decades later? "Stealing the votes" of elderly blacks in a voter-fraud case that predictably went nowhere and ended in all of those accused being acquitted. It was the same Jeff Sessions about whom one senator wondered out loud whether he could dole out justice impartially. Session was 38 then; he's 69 now. Since he was elected to the U.S. Senate in 1996, not much has radically changed as Sessions has pushed against justice and immigration reforms, championed mandatory minimum sentences, and fought against closing the irrational gap in penalties between crack and powder cocaine, which targets blacks disproportionately. “It is inconceivable to me that a person of this attitude is qualified to be a U.S. attorney, let alone a U.S. federal judge,” the late Sen. Edward Kennedy said about Sessions during the 1986 confirmation. But it was only a few weeks ago that it was inconceivable Trump could be elected president.